Ultra-fast 320 series 802.11ac Wave 2 APs offer the highest performance in high-density environments and can be managed by a Mobility Controller or deployed in controllerless Aruba Instant mode. 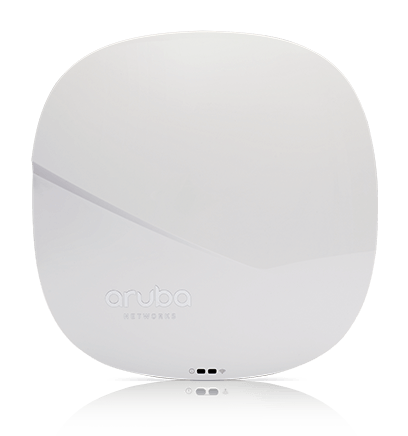 Starting with the 320 series, Aruba access points have an integrated BLE Beacon to remotely manage battery-powered Aruba Beacons. 320 series APs have an integrated BLE Beacon to simplify management of a large-scale network of battery-powered Aruba Beacons. 5 GHz (1,733 Mbps max rate) and 2.4 GHz (600 Mbps max rate) radios, each with 4x4 MIMO support and a total of four combined, diplexed (dual-band) external RP-SMA antenna connectors. AP type: Indoor, dual radio, 5 GHz 802.11ac and 2.4 GHz 802.11n 4x4 MIMO. Software-configurable dual radio supports 5 GHz (Radio 0) and 2.4 GHz (Radio 1). Four spatial stream SU-MIMO for up to 1,733 Mbps wireless data rate to a single client device. Three spatial stream MU-MIMO for up to 1,300 Mbps wireless data rate to up to three MU-MIMO capable client devices simultaneously. Support for up to 256 associated client devices per radio, and up to 16 BSSIDs per radio. Dynamic frequency selection (DFS) optimizes the use of available RF spectrum. Advanced Cellular Coexistence (ACC) minimizes interference from cellular networks. Maximum ratio combining (MRC) for improved receiver performance. Short guard interval for 20-MHz, 40-MHz and 80-MHz channels. Space-time block coding (STBC) for increased range and improved reception. Transmit beamforming (TxBF) for increased signal reliability and range. Maximum (worst-case) power consumption in idle mode: 8W (PoE) or 7W (DC). Direct DC source: 48Vdc nominal, +/- 5%. Eight integrated downtilt omni-directional antennas for 4x4 MIMO with maximum antenna gain of 4.0 dBi in 2.4 GHz and 4.7 dBi in 5 GHz. Built-in antennas are optimized for horizontal ceiling-mounted orientation of the AP. The downtilt angle for maximum gain is ~ 30 degrees. Combining the patterns of each of the antennas of the MIMO radios, the peak gain of the effective per-antenna pattern is 2.7dBi in 2.4GHz and 2.9dBi in 5GHz. 320 Series Access Points are not supported on 650 Series Mobility Controllers. AP-325 vs IAP-325 Hardware Difference?